Every year I try to carve a pumpkin to celebrate, and conveniently it's also an excuse to roast pumpkin seeds! (Clearly I can be baited into doing anything for food). 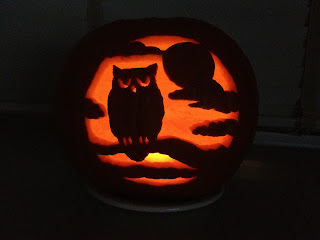 Granted it's a few notches harder than the jack-o-lanterns with triangle eyes I used to carve as a kid, but believe it or not it's totally doable! All you'll need are some basic pumpkin carving tools, a pattern to carve, toothpicks and a glue stuck. Oh, and a pumpkin! Happy Friday everyone! Don’t Fridays just make you want a margarita? Ok, yes, it seems that I could use a margarita everyday but when I get that hankering for something special after work Dos Caminos is the place! 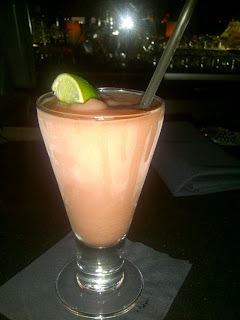 While they offer a variety of different margaritas, cocktails, and tequilas, Dos Caminos to me means the Frozen Prickly Pear Margarita. It’s the perfect consistency (not too watery or slushy yet not too ice-cubey) and comes suuuper cold (watch out for that brain freeze!). The taste, while maybe a touch sweet, goes down super easy and is perfect in masking that tequila. But let me assure you…the tequila is definitely in there! Dos Caminos does not offer any Happy Hour specials so this little gem will set you back $11. But you probably only need 1-2 of these bad boys and should be good to go. 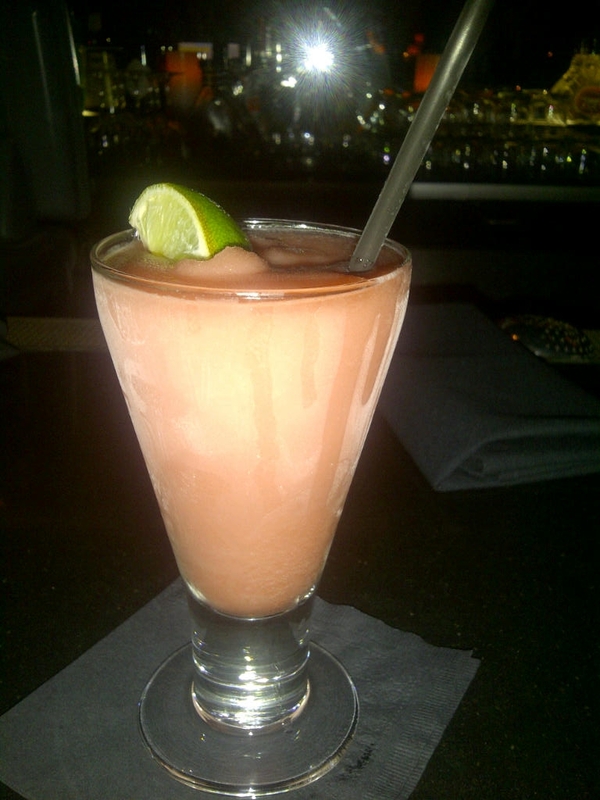 My Prickly Pear margarita - its so cold the glass is starting to frost! Guilty. I may have taken late night munchies to an extreme. But it was so worth it! 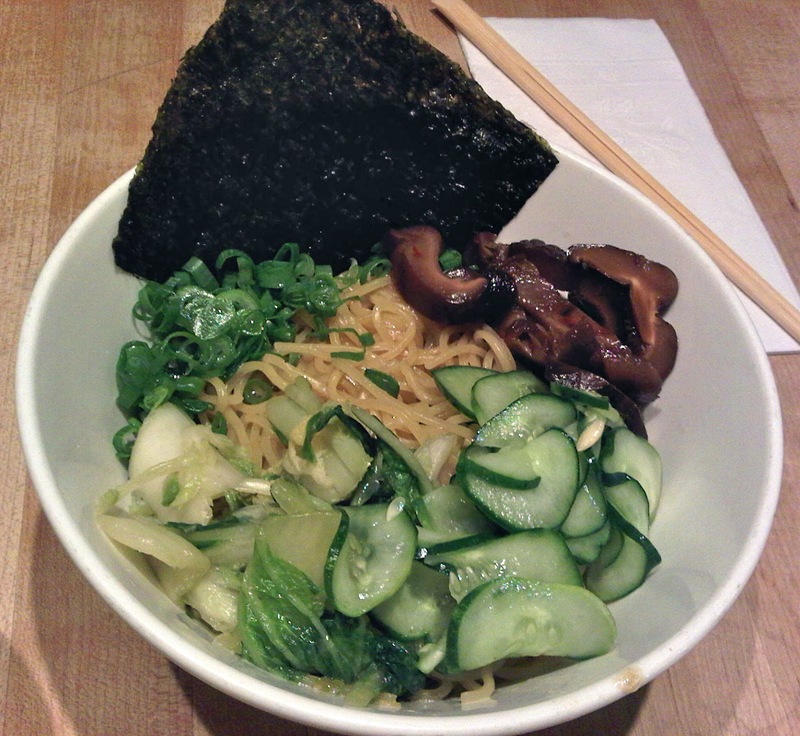 Momofuku Noodle Bar serves their late night menu between 12am and 2am. It's pretty limited with just about a handful of things to choose from, but fear not - it doesn't mean you won't want ALL of it! Fortunately we strolled in just in time about a half hour before closing. 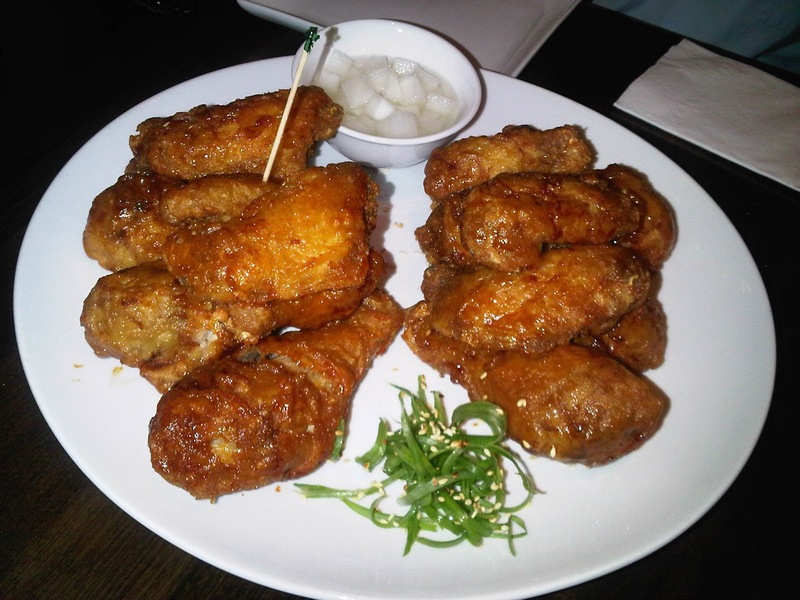 When you have the munchies, imagine how hard it is to choose between chicken wings, noodles, pork buns, rice cakes and ramen. Um, is there a choice (F) All of the above?? In the end we narrowed it down to Ginger Scallion Noodles and Smoked Chicken Wings (and a bottle of Sake! oops). 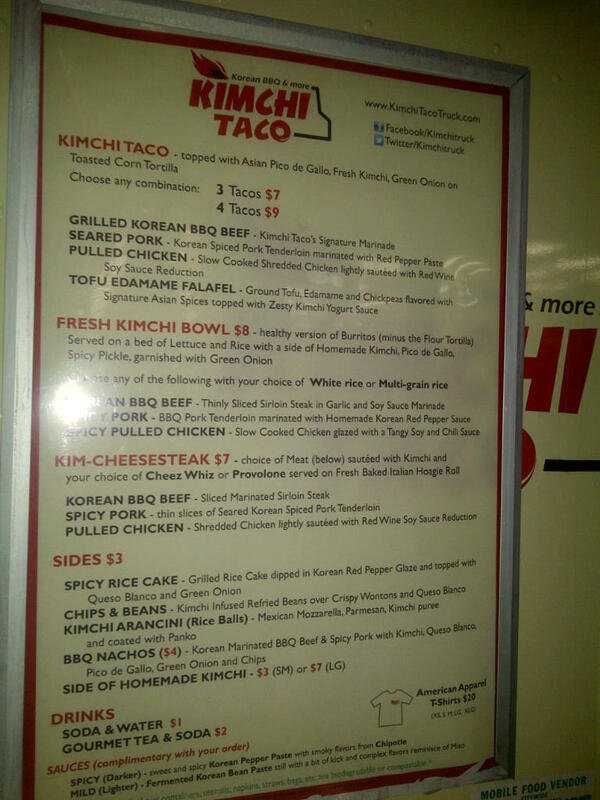 While heading home after a day of errands, I noticed the Kimchi Taco Truck parked right around the corner from my apartment. I didn't think I was hungry at the time but one whiff as I walked past was all it took for me to rethink my current situation: sudden mouthwatering hunger. Double bonus for me: no line at the truck AND I had cash on me (a rarity). 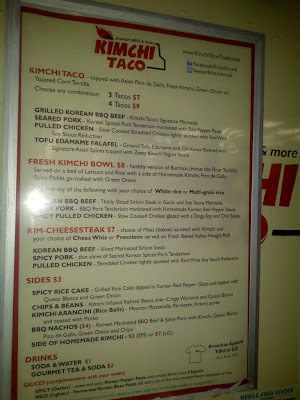 My crooked shot of the menu - you can check out their website here for more details on their menu. A quick look in my wallet showed $11. With my budget in mind and a quick scan of the menu, I settled on an order of the Spicy Rice Cakes ($3) and the set of 3 tacos ($7): Grilled Korean BBQ Beef, Pulled Chicken, and Tofu Edamame Falafel. Ice cream trucks are a childhood favorite of mine. And by ice cream truck, I mean all ice cream (truck or not). I love it all! When I first moved to the city, Mr. Softee trucks were on almost every corner and I was ecstatic. No more waiting and hoping for the truck to go down my block - I can choose when I want it! Sadly, each time I went to Mr. Softee I walked away disappointed - just didn't quite hit the spot for me. Lucky for me, the recent explosion of food trucks has brought in lots of new and different ice cream options yay! One that I recently got to try was Coolhaus. Known for eccentric all-natural handmade ice cream flavors and various cookie options, you can pick an ice cream and pair it with two cookies to make your own ice cream sandwich! Each sandwich is $6 and comes in its signature slanty shape (similar to the roof of the truck!) wrapped in edible paper. 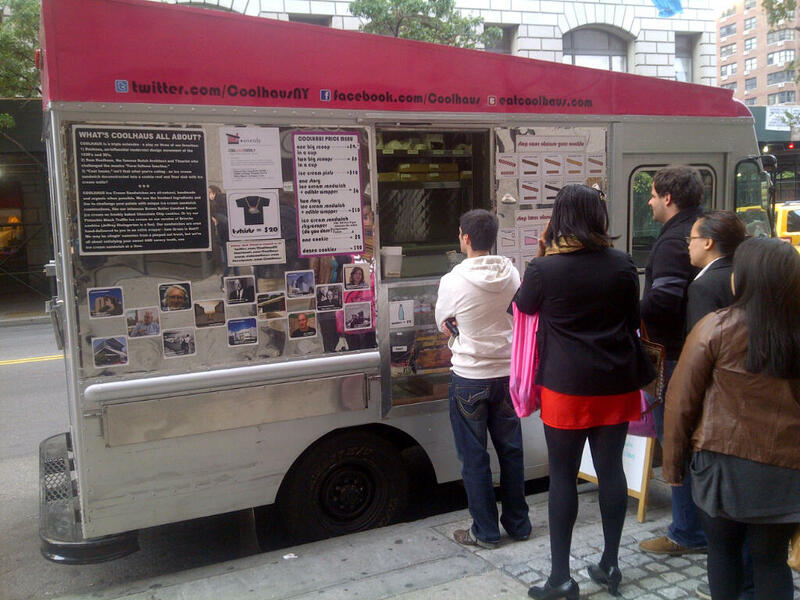 Coolhaus truck - with its roof in its signature shape! Once upon a time, there was a day when Piggy KL disliked avocados. Mushy and green?? Double yuck. And then she went to Mexico and tried Guacamole and her life changed forever! 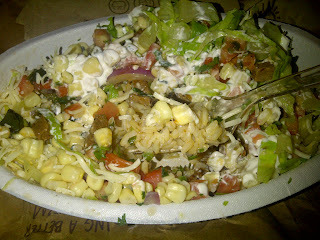 Haha ok so maybe it wasn't really life-changing, but it did open my eyes to how delicious avocados are. On that note, Guacamole is awesome - it's a fantastic and easy snack to make. 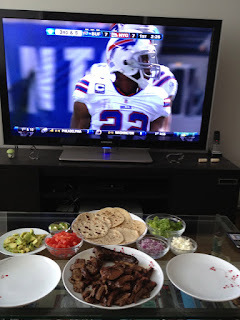 I happened to whip up a bowl while watching the Giants game this past Sunday to accompany my Steak Tacos. Since the ingredients for both recipes overlap, it was super easy! I found the recipe from Dos Caminos (Mexican restaurant in NYC) and adapted it to my liking. I love that their recipe calls for minimal salt (and I used even less!) and adds some heat with some Jalapeno and/or Serrano peppers. Follow along to see how I made it! 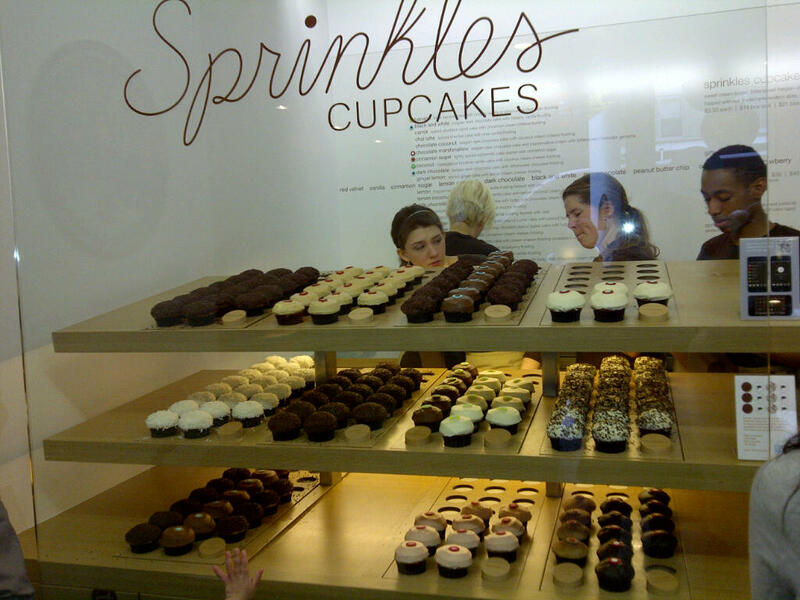 Earlier this year, Sprinkles opened its first outpost in NYC. I was a big fan of the tv show Girls Next Door and Bridget Marquardt, one of the stars of the show, often talked about how Sprinkles cupcakes were her favorite. When this LA-based cupcakery finally set up shop on the Upper East Side I was excited to finally have a taste! Its location across the street from Bloomingdale's is definitely convenient (and deadly). The outside of the store is decorated with colorful cascading sprinkles. The inside, while not spacious, is bright and clean with strategically placed display cases filled with their different cupcake options - your eyes just can't help but be drawn towards it! My friend R and I ordered three (yes that's right...I said three!) cupcakes to share: one red velvet, one vanilla, and one salted caramel. Sunday football is the norm at my place these days, especially when the Giants or Jets are playing. Lately we've been watching the games at home and I make some yummy things to nosh on. This week, hubby requested 'upscale bar food'. What does that mean?? Scratching my head, I finally decided on Steamy Kitchen's Steak Tacos! Her recipe doesn't require any sauce, which really intrigued me. One thing you'll observe from my cooking is I tend to cut down on anything very saucy or heavy. I like to keep things fresh so the ingredients carry the dish, not the sauce or seasoning. And so, her Steak Tacos seemed right up my alley! I tweaked her recipe a bit, so keep reading to see how I made them! Steak Tacos? Check. Giants? Check. It's GAME TIME! I’ve recently been blessed with two excuses to go to ABC Kitchen: the first was for a dinner with out-of-towners and the second was for brunch. One of Jean-Gorges newest restaurants, this local and organic food focused eatery won Best New Restaurant at the 2011 James Beard Restaurant and Chef Awards. 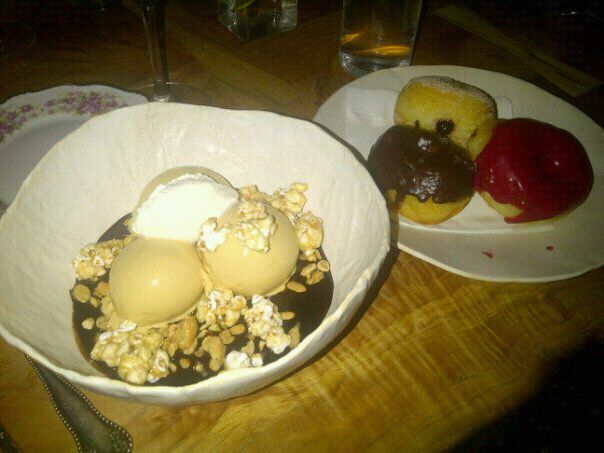 After giving ABC Kitchen a go myself, I can see why it has garnered so much attention in the last year. Both times I ate there I was so absorbed by my meal that I neglected to write anything down or take any pictures (by the time I remembered we were on dessert!). For that reason, I won’t go into details of what I ordered as I’m sure I’ll be back but I did want to pass along my two-cents thus far on ABC Kitchen. Salted caramel ice cream sundae - comes with caramel popcorn, peanuts, chocolate sauce and whipped cream on top (ignore the donuts on the side...they were disappointing) . I really enjoyed both of my experiences there and loved the gorgeous setting inside (it’s attached to ABC Carpet and Home…can’t go wrong on decoration there!). And while not my style, I appreciated the mismatching silverware and dishes and felt that it really added to the shabby-chic/vintage yet still elegant vibe. Regarding the food, you’ll have to wait for me to go back and write things down next time. But if you have a chance to give it a go before I finish a full post on ABC Kitchen, you MUST MUST MUST get the crab toast and the ice cream sundae. Both shareable. Both unbelievable. Trust me – you will not regret it. The Piggys are in school again! Just kidding. But we are enrolled in Cake Decorating Basics at the NY Cake Academy. Granted it's not a baking class so no guarantee our baking skills will be stellar after we 'graduate', but our baked goods will sure look snazzy! 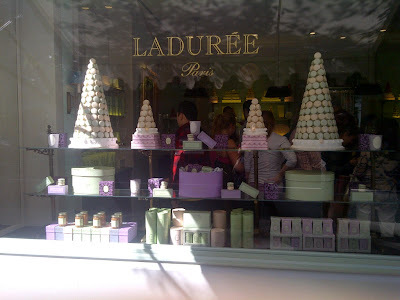 The three lessons in the course are structured by Wilton, but offered by the NY Cake store in NYC. The class is held in the basement of the store where there are tables and stools set up to accommodate about 10-12 students. 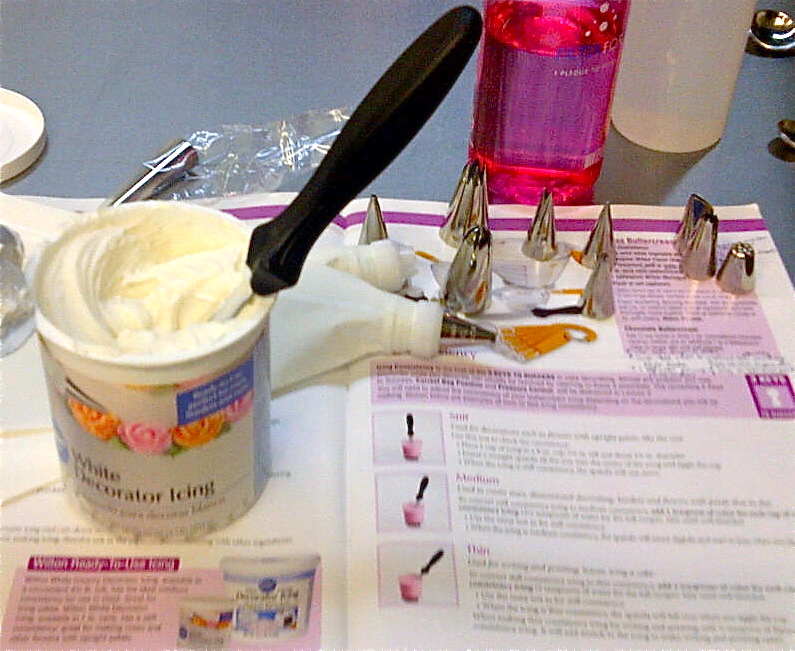 The class costs $100 for three 2 1/2 hour lessons and students are responsible for purchasing some Wilton supplies for the class, including the Decorating Basics Student Kit (comes with fun toys like icing bags, basic decorating tips, couplers, a spatula and a practice board with patterns), icing, icing colors, extra spatulas and other baking tools we still have yet to learn how to use! So far the basic supplies have cost about $60, money happily spent by us Piggys to further our cake decorating careers! Displaying some of our decorating tools. See all the different tips too? Can't wait to learn how to use them! Popovers from BLT Prime are delish! Light and airy, sooo good. Have you ever tried them? While most people are unwilling to make the trek out to Coney Island, it’s actually one of my favorite escapes from the city. The boardwalk, aquarium, carnival rides, views of the ocean…I love it! 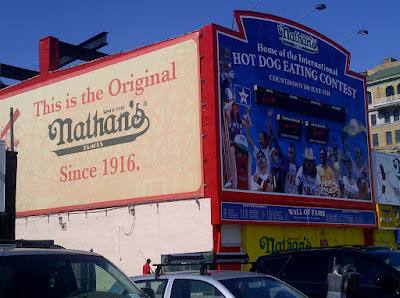 Sadly, the only way I’m able to lure the bf out to make the trip with me is with promises of lunch at Nathan’s Famous. And as much as I complain about it, eating at the original Nathan’s is definitely a secret guilty pleasure of mine! Home of the July 4th Hot Dog Eating Contest, this Nathan’s in Coney Island not just any Nathan’s but the very FIRST Nathan’s ever opened! What better way to kick off a trip to Atlantic City than with cards and dice? 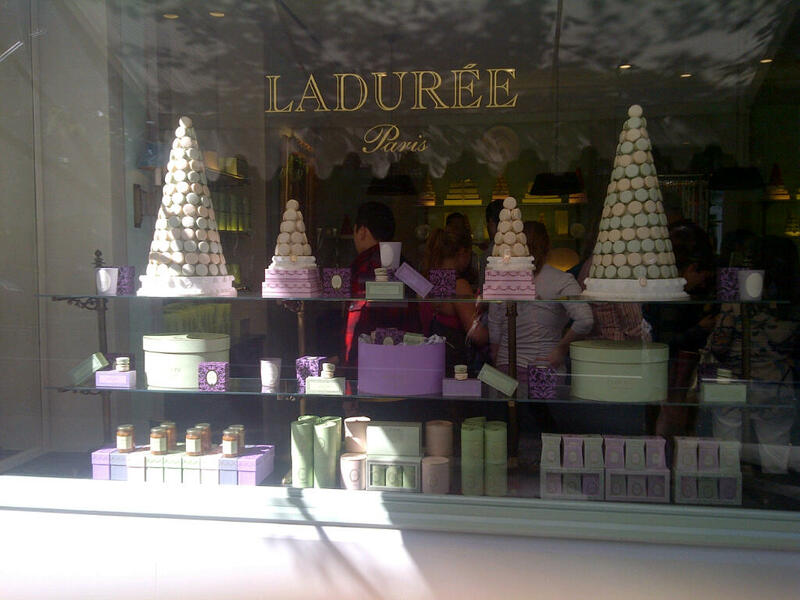 Made of chocolate, of course! Along with the chocolate mold, I also picked up a 1 pound bag of mixed colored chocolate melts. Mine came with regular milk chocolate, white chocolate and orange chocolate melts. Now let's get started! One color at a time, microwave the chocolate melts on 50% power for 1 minute in a microwavable bowl. Stir and repeat until the chocolate is melted. The consistency should be fluid, so that it easily dribbles off your spoon. Yummm, go ahead and lick that spoon, indulge yourself! I am a marketer’s dream consumer. Put together some hype with a high probability of getting ripped off and I'm sold! 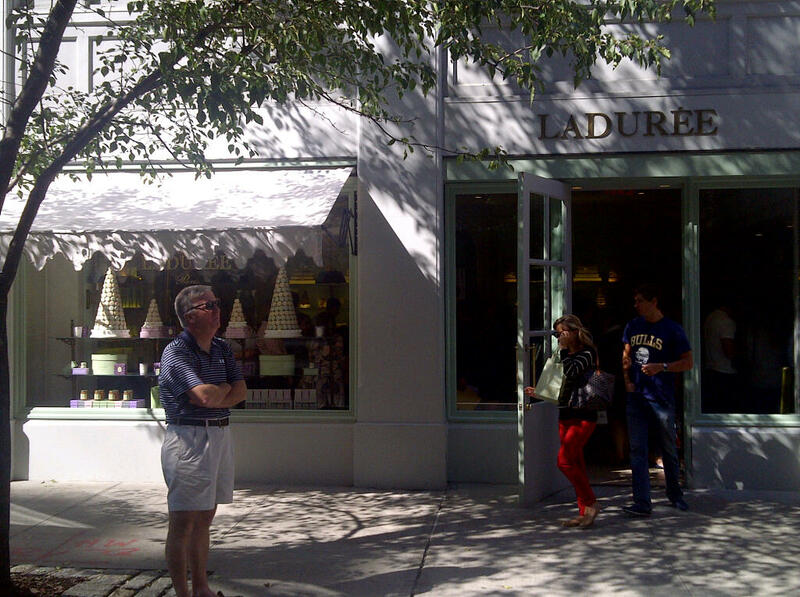 Naturally, when I heard that Laduree was opening an Upper East Side store at the end of August (their first US location! ), it was no surprise that I was immediately swept into feelings of “I need to have it now!!!”. However, opening week offered disappointing reports of hour-long waits just to get into the store and the likely probability that must-try flavors would be sold out before you even get up to the counter. Thus I strategically waited until a recent Saturday which overlapped with a long holiday weekend. I set off towards Madison and 70th Street, determined to wait however long it would take for me to get those macarons. As I approached the store and saw that there was no line out the door I could hear the angels singing (oh wait… that was just me screaming “yipeee” as I giddily ran in). 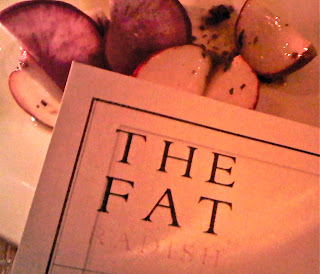 A year ago, a charming little restaurant called The Fat Radish opened its doors on Orchard Street. The fare is British and their website advertises a simple, healthy menu with seasonal ingredients. I had a 9:30PM reservation for Saturday night and while waiting for our table, spotted Ben Towill, the chef and a partner of The Fat Radish, celebrating the restaurant's 1-year anniversary with dear friends and champagne. How fun! Even with a reservation on the later side, we waited 30 minutes for our table. They didn't seem to be efficient in turning over tables as I noticed ours had been empty for nearly 10 minutes before we sat down. For starters, we ordered the Scotch Egg and the Duck Rillette Terrine. I recommend both! 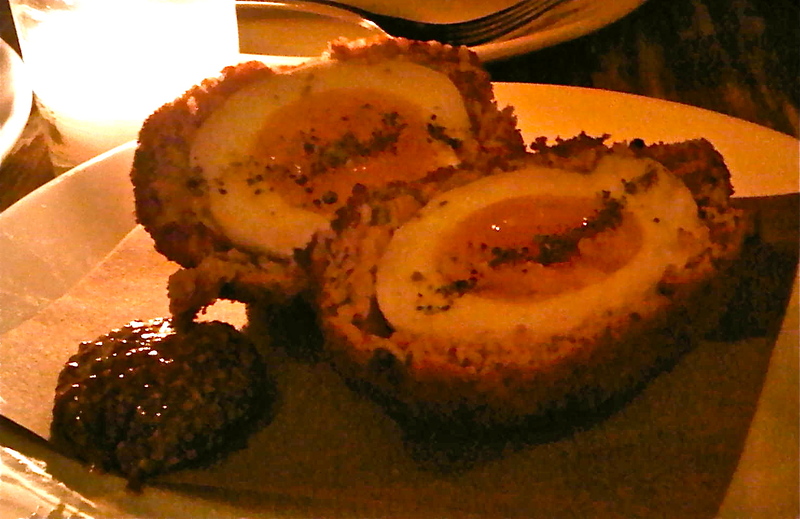 The Scotch Egg was unusual in that the whole egg was crusted with meat and fried. I'm a sucker for anything fried (or heck, even double-fried!) so I enjoyed it, but I think frying it took away from showcasing the freshness of the egg. The Duck Rillette Terrine had a subtle smoky flavor and was served with onion jam and crispy bread. The smokiness and soft texture of the terrine was fantastic! 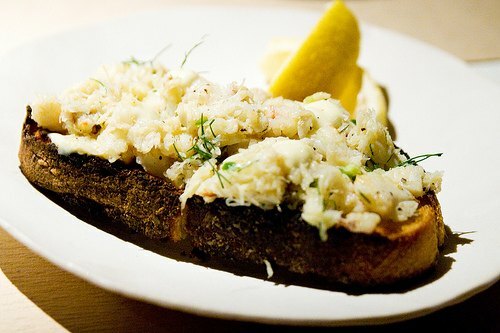 Next to Hello Kitty, blue crabs were one of the first loves of my life. While starting me on piano lessons, my mom also felt that it was time for my little six-year old Asian fingers to learn how to open and eat blue crabs all by myself. I’ve been self-sufficient ever since! Fast forward twenty or so years: when I heard that there was a place in Brooklyn which offered an all–you-can-eat blue crab special for $32.95 with seating out on the water, I just HAD to check it out. 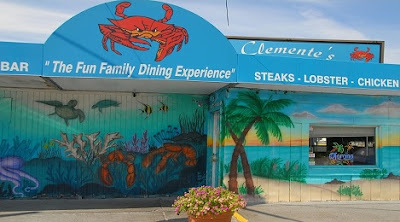 Unfortunately for me, Clemente’s Crab House is wayyyy out in Sheepshead Bay and not easily accessible via public transport (woe is my beloved monthly metrocard). Fortunately for me, I have awesome friends who have a car and offered to soothe my ache for a piece of sweet sweeeeet crab. On a Sunday afternoon, we started our journey to Clemente’s Crab House (note to readers – it’s cash only so head to the atm before leaving). 35 minutes and a couple shady back road detours later, we finally arrived! 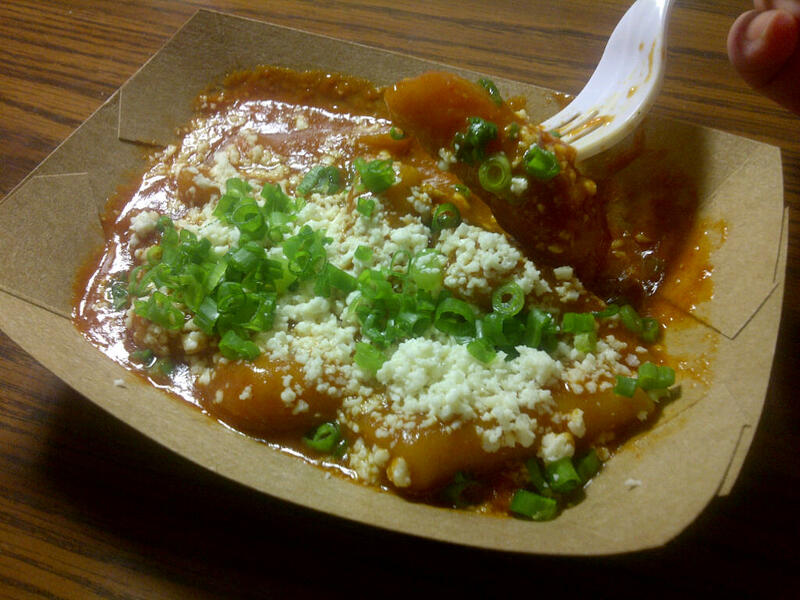 Lucky for me, one of Bian Dang food truck's regular lunch stops happens to be across the street from my office. If you can't make it to their food truck, don't worry because they have a store front inside the Food Court in K-town (West 32nd Street btwn Broadway and 5th Avenue). They are best known for their Taiwanese-style Fried Pork Chop or Fried Chicken over Rice with Pork Sauce. 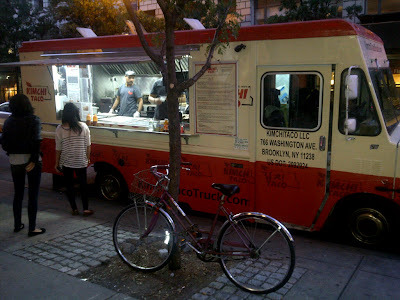 I had the Fried Chicken over Rice several years ago (back when they were called the NYC Cravings truck). I remember it was a good amount of food for the money, though a bit difficult to eat at the office for lunch. More recently, I tried their Zongzi (Chinese tamale) and steamed pork dumplings. The dumplings were meaty and plump with thick skin (my favorite kind). For $3 it was worth it! Unfortunately I'm mixed on the Zongzi. I've gotten it two different times and both instances it was not evenly cooked through. There were parts where the rice was hard and, well for lack of a better word, uncooked. I just ate around these parts, as the rest of the Zongzi was still good. It was disappointing because I was so excited that the truck actually made it! A well-made Zongzi is a hard find in NYC ever since the Queen of them, May May on Pell Street (Chinatown), closed down several years ago. 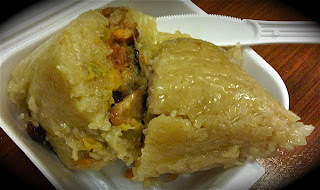 Bian Dang's are decent - the Zongzi are a good size and the ingredients are savory and plentiful. If only they were fully cooked! In any case, I don't know of any other Taiwanese food trucks floating around the city so I'll probably still return. 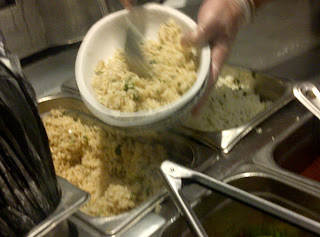 Maybe next time I will give the Fried Chicken over Rice another shot. Piggy says eh for the Zongzi, but yes for the truck!